Today was a more interesting Wednesday than normal. 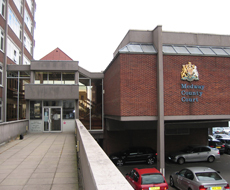 The day started with my normal routine Wednesday study time but today I stopped after lunch as I had to go to court to be a witness in a case that I am surprised got all the way to the county court, particularly as the incident allegedly happened in November 2007. We met the barrister at around 1.30 and then waited to be called. After the barristers went in to the court room at 2.30 I was then left waiting for over an hour before I was called to give my evidence. At the end the judge kindly gave me permission to go but I asked if I could stay as I wished to see the outcome of the case. She kindly agreed and I can say that the person I was giving evidence on behalf of had the case against him dismissed. It was great to see, in my opinion, justice done in the court. I don’t want to talk about the case as I don’t think that would be right but it was an amazingly interesting 4 or so hours that I spent in the courts. The number of conversations overheard was fascinating and the stress that many were under in family or small claim situations was clearly, and sadly, tangible. People were fairly emotional but despite this there was a strange air of calm about the place. My main relfection from today is all around the idea of justice and how people can view the same incident differently. Today there were many people going into rooms to disagree with each other but, quite interestingly, willing to trust and abide by the judgment of one person after he or she had heard all the evidence from both sides. I think we take this for granted but I feel this is a massive plus of our society. Most of these people had very large grievances and yet – after being heard they were willing to allow someone else to make a decision that they would abide by. Although some may ague that it is sad that most of these arguments could not be sorted out before hand, I think today has shown a real strength and credit of humanity and its trust of each other. This entry was posted in justice by robryan65. Bookmark the permalink.